Marriage and family therapists have unique confidentiality concerns, because the client in a therapeutic relationship may be more than one person. Therapists respect and guard confidences of each individual client. (d) if there is a waiver previously obtained in writing, and then such information may be revealed only in accordance with the terms of the waiver. In circumstances where more than one person in a family receives therapy, each such family member who is legally competent to execute a waiver must agree to the waiver required by subparagraph (d). With out such a waiver from each family member legally competent to execute a waiver, a therapist cannot disclose information received from any family member. 2.2 Marriage and family therapists use client and/or client materials in teaching, writing, and public presentation only if a written waiver has been obtained in accordance with Subprinciple 2.1 (d), or when appropriate steps have been taken to protect client identity and confidentiality. 2.3 Marriage and family therapists store or dispose of client records in ways that maintain confidentiality. These Standards are potentially applicable to the professional and scientific activities of all psychologists. 5.01 Discussing the Limits of Confidentiality. (2) the foreseeable uses of the information generated through their services. (c) Permission for electronic recording of interviews is secured from clients and patients. 5.03 Minimizing Intrusions on Privacy. (a) In order to minimize intrusions on privacy, psychologists include in written and oral reports, consultations, and the like, only information germane to the purpose for which the communication is made. (b) Psychologists discuss confidential information obtained in clinical or consulting relationships, or evaluative data concerning patients, individual or organizational clients, students, research participants, supervisees, and employees only for appropriate scientific or professional purposes and only with persons clearly concerned with such matters. Psychologists maintain appropriate confidentiality in creating, storing, accessing, transferring, and disposing of records under their control, whether these are written, automated, or in any other medium. Psychologists maintain and dispose of records in accordance with law and in a manner that permits compliance with the requirements of this Ethics Code. (4) to obtain payment for services, in which instance disclosure is limited to the minimum that is necessary to achieve the purpose. (b) Psychologists also may disclose confidential information with the appropriate consent of the patient or the individual or organizational client (or of another legally authorized person on behalf of the patient or client), unless prohibited by law. 5.07 Confidential Information in Databases. (a) If confidential information concerning recipients of psychological services is to be entered into databases or systems of records available to persons whose access has not been consented to by the recipient, then psychologists use coding or other techniques to avoid the inclusion of personal identifiers. (b) If a research protocol approved by an institutional review board or similar body requires the inclusion of personal identifiers, such identifiers are deleted before the information is made accessible to persons other than those of whom the subject was advised. (c) If such deletion is not feasible, then before psychologists transfer such data to others or review such data collected by others, they take reasonable steps to determine that appropriate consent of personally identifiable individuals has been obtained. 5.08 Use of Confidential Information for Didactic or Other Purposes. (a) Psychologists do not disclose in their writings, lectures, or other public media, confidential, personally identifiable information concerning their patients, individual or organizational clients, students, research participants, or other recipients of their services that they obtained during the course of their work, unless the person or organization has consented in writing or unless there is other ethical or legal authorization for doing so. 5.09 Preserving Records and Data. A psychologist makes plans in advance so that confidentiality of records and data is protected in the event of the psychologist's death, incapacity, or withdrawal from the position or practice. 5.10 Ownership of Records and Data. Recognizing that ownership of records and data is governed by legal principles, psychologists take reasonable and lawful steps so that records and data remain available to the extent needed to serve the best interests of patients, individual or organizational clients, research participants, or appropriate others. 5.11 Withholding Records for Nonpayment. Psychologists may not withhold records under their control that are requested and imminently needed for a patient's or client's treatment solely because payment has not been received, except as otherwise provided by law. 1. The primary obligation of certified counselors is to respect the integrity and promote the welfare of clients, whether they are assisted individually, in family units, or in group counseling. In a group setting, the certified counselor is also responsible for taking reasonable precautions to protect individuals from physical and/or psychological trauma resulting from interaction within the group. 2. Certified counselors know and take into account the traditions and practices of other professional disciplines with whom they work and cooperate fully with such. If a person is receiving similar services from another professional, certified counselors do not offer their own services directly to such a person. If a certified counselor is contacted by a person who is already receiving similar services from another professional, the certified counselor carefully considers that professional relationship as well as the client's welfare and proceeds with caution and sensitivity to the therapeutic issues. When certified counselors learn that their clients are in a professional relationship with another counselor or mental health professional, they request release from the clients to inform the other counselor or mental health professional of their relationship with the client and strive to establish positive and collaborative professional relationships that are in the best interest of the client. Certified counselors discuss these issues with clients and the counselor or professional so as to minimize the risk of confusion and conflict and encourage clients to inform other professionals of the new professional relationship. 3. Certified counselors may choose to consult with any other professionally competent person about a client and must notify clients of this right. Certified counselors avoid placing a consultant in a conflict-of-interest situation that would preclude the consultant serving as a proper party to the efforts of the certified counselor to help the client. 4. When a client's condition indicates that there is a clear and imminent danger to the client or others, the certified counselor must take reasonable action to inform potential victims and/or inform responsible authorities. Consultation with other professionals must be used when possible. The assumption of responsibility for the client's behavior must be taken only after careful deliberation, and the client must be involved in the resumption of responsibility as quickly as possible. 5. Records of the counseling relationship, including interview notes, test data, correspondence, audio or visual tape recordings, electronic data storage, and other documents are to be considered professional information for use in counseling. Records should contain accurate factual data. The physical records are property of the certified counselors or their employers. The information contained in the records belongs to the client and, therefore, may not be released to others without the consent of the client or when the counselor has exhausted challenges to a court order. The certified counselors are responsible to insure that their employees handle confidential information appropriately. Confidentiality must be maintained during the storage and disposition of records. Records should be maintained for a period of at least five (5) years after the last counselor/client contact, including cases in which the client is deceased. All records must be released to the client upon request. 6. Certified counselors must ensure that data maintained in electronic storage are secure. By using the best computer security methods available, the data must be limited to information that is appropriate and necessary for the services being provided and accessible only to appropriate staff members involved in the provision of services. Certified counselors must also ensure that the electronically stored data are destroyed when the information is no longer of value in providing services or required as part of client's records. 7. Any data derived from a client relationship and used in training or research shall be so disguised that the informed client's identity is fully protected. Any data which cannot be so disguised may be used only as expressly authorized by the client's informed and uncoerced consent. #9. Confidentiality Requirement. Counselors must keep information related to counseling services confidential unless disclosure is in the best interest of clients, is required for the welfare of others, or is required by law. When disclosure is required, only information that is essential is revealed and the client is informed of such disclosure. #10. Confidentiality Requirements for Subordinates. Counselors must take measures to ensure that privacy and confidentiality of clients are maintained by subordinates. #11. Confidentiality in Group Work. Counselors must clearly communicate to group members that confidentiality cannot be guaranteed in group work. #12. 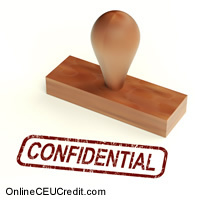 Confidentiality in Family Counseling. Counselors must not disclose information about one family member in counseling to another family member without prior consent. #13. Confidentiality of Records. Counselors must maintain appropriate confidentiality in creating, storing, accessing, transferring, and disposing of counseling records. #14. Permission to Record or Observe. Counselors must obtain prior consent from clients in order to record electronically or observe sessions. #15. Disclosure or Transfer of Records. Counselors must obtain client consent to disclose or transfer records to third parties, unless exceptions listed in Standard of Practice Nine exist. #16. Data Disguise Required. Counselors must disguise the identity of the client when using data for training, research, or publication. The preceding section contained Codes of Ethics for mental health professionals. Write three case study examples regarding applications of Ethical Principles you feel are in the gray areas for your profession.